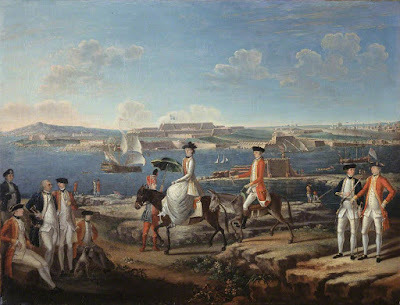 Lady Johnstone, Wife of the Governor of Menorca, Accompanied by Officers of the 25th Regiment of Foot and the Royal Navy, and a Naval Seaman, attributed to Giuseppe Chiesa, c. 1769-1771, National Army Museum via ArtUK. In a previous post I linked the image of a Royal Navy seaman illustrated in John Mollo's Uniforms of the American Revolution to a piece from the 1790's or early 1800's, rather than from Mollo's supposed source: a painting of the 25th Regiment of Foot at Minorca. Thanks to reader Steve Rayner, we now have that painting. 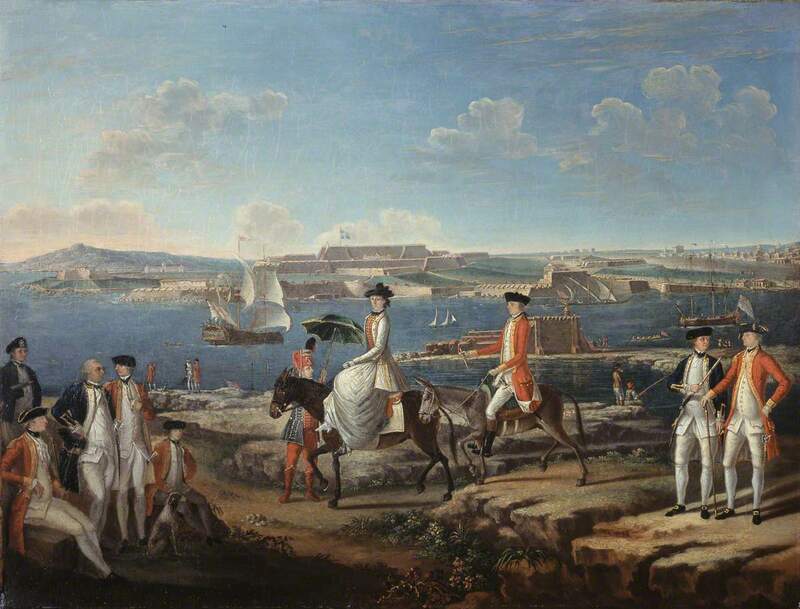 There six paintings of the 25th Regiment at Minorca in this period. None of them are signed, but all of them offer wonderful detail on the officers' uniforms. This piece is useful to us for its inclusion of naval uniforms as well. As Mollo portrayed him, he clearly is wearing a barge cap with a metal badge, not unlike that described by Jacob Nagle. 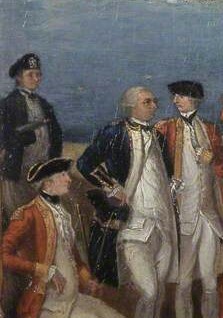 As per the regulations updated in 1767, the naval officer to the right foreground of the sailor appears to be wearing a captain's uniform. If we assume (and it would be nothing more than an assumption) that the seaman is attached to that officer, he would be wearing that captain's coat of arms on his barge cap. However, unlike Mollo's piece, the sailor's waistcoat is not striped. The resolution is too low to draw any conclusions about whether, as in Mollo's book, he wears brass buttons. His handkerchief is black, but is tucked in to his waistcoat, rather than loose. The style of his cuffs is not apparent. It appears that he wears plain petticoat trousers. It appears that he has a spyglass tucked under his right arm.